FAIRPORT, New York – February 18th, 2019 – TekTracking announced today it has received an order from an unnamed Class 1 railroad for the patent-pending Safety Light Monitor (SLM) pilot system. The TekTracking SLM is a patent-pending sensor platform used to measure & verify the operation of safety lights used in grade crossings, wayside signals, and similar safety critical lighting applications. The SLM is a wireless, self-powered, self-charged, robust multi-sensor device designed to operate over 10 years without intervention. FAIRPORT, New York – January 10, 2018 – TekTracking LLC announced the launch of the world’s first safety light performance monitor, the Safety Light Monitor (SLM). 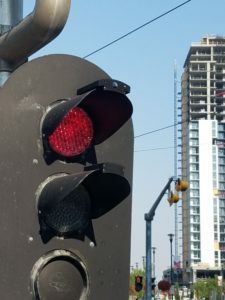 The TekTracking SLM is a patent pending sensor platform used to measure &amp; verify the operation of safety lights used in grade crossings, wayside signals, and similar safety critical lighting applications. The SLM is a wireless, self-powered, self-charged, robust multi-sensor device designed to operate over 10 years without intervention. 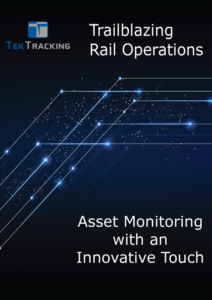 to TekTracking CEO Greg Fogarty, “our SLM opens the door to building greater safety into rail networks by enabling complete remote condition monitoring solutions”. The Signal Light Monitor is easily mounted to the top of the sunshield on a safety critical light. image analysis on captured images. Mpec working with TekTracking have received another large order to expand the roll out of Remote Condition Monitoring of wayside assets on the railroad’s next most critical subdivision. This will take the number of assets being monitored to over 500 with many more planned, Mpec & TekTracking are also working closely with the Railroad on analyzing the data for trends specific to the Railroad and the geographical conditions. This Railroad has already seen an ROI for the equipment installed based on the correlation between reduced switch failure and reduced train delay as a direct result. FAIRPORT, New York – November 9, 2017 – TekTracking LLC, a technology sales and product development firm assisting OEM’s with sales strategy, planning, and execution in the North American railroad industry, is pleased to announce the appointment of Gregory Fogarty as Chief Executive Officer (CEO). The appointment is part of a planned leadership transition to advance TekTracking’s offering in the North American rail industry. 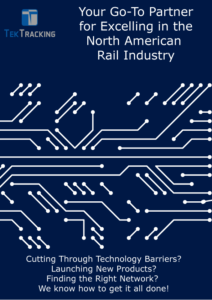 “The suite of products that we are bringing to the market will help freight and transit railroads run with enhanced safety and efficiency, and will decrease their current operational cost significantly. Our strategy is to take the issues that people on the frontlines face every day and present them with innovative technologies and ideas for solving their problems. This is how our organization adds value for our customers.” said Fogarty. Fogarty has over sixteen years of engineering, technical sales and executive management experience in complex transportation markets. Prior to founding TekTracking, Fogarty was vice president of sales with Tyler Technologies, a public-sector software firm, where he directed a nationwide team of account executives, sales associates and business partners, and achieved 35% revenue growth during his two-year tenure. Prior to Tyler Technologies, Fogarty was vice president of sales at RailComm, a leader in fixed-rail automation systems. Greg Fogarty earned a HND/BS in Electrical & Electronic Engineering from Griffith College in Limerick, Ireland, and an MBA from the University of Rochester Simon School of Business, in New York, USA.